Withania somnifera . From Jessop & Toelken (eds) Flora of South Australia 3: fig. 580 (1986). Part of AD herbarium specimen collected near Port Lincoln. Withania Pauquy, Diss. Bellad. 14 (1825) (nom. cons. ); after Henry Witham, an English palaeobotanist of the early 19th century. 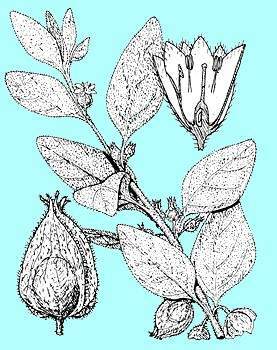 Type species: W. frutescens (L.) Pauquy; Atropa frutescens L.
Shrubs, glabrous or pubescent. Leaves alternate, or opposite on flowering stems, simple, entire, petiolate. Flowers solitary or in clusters, axillary, bisexual, actinomorphic. Calyx campanulate, 5–lobed, persistent and inflated in fruit; lobes triangular. Corolla campanulate, 5–lobed; lobes valvate in bud. Stamens 5, equal in height, inserted near base of corolla-tube; anthers bilocular, cohering, dehiscing by longitudinal slits. Ovary bilocular. Fruit a semi-succulent berry. Seeds disc-shaped to almost reniform. A genus of c. 10 species occurring predominantly from North Africa and the Mediterranean basin to India. One species naturalised in Australia. D.E. Symon, The solanaceous genera, Browallia, Capsicum , Cestrum, Cyphomandra, Hyoscyamus, Lycopersicon, Nierembergia, Physalis, Petunia, Salpichroa and Withania, naturalised in Australia, J. Adelaide Bot. Gard. 3: 133–166 (1981). Only Withania somnifera is recorded as an introduction in Australia.